First off: among all of the celebrities from the world of fashion and film, there was a real-life queen in attendance at this year's gala. Here's Queen Rania of Jordan, looking elegant as always, arriving at the ball. Along with her glittering earrings, she appears to be wearing a jeweled hair ornament. Also there: Charlotte Casiraghi! As per usual, she kept her jewelry to a minimum, but we did get a glimpse of a glittering ring and a couple of bangle bracelets. 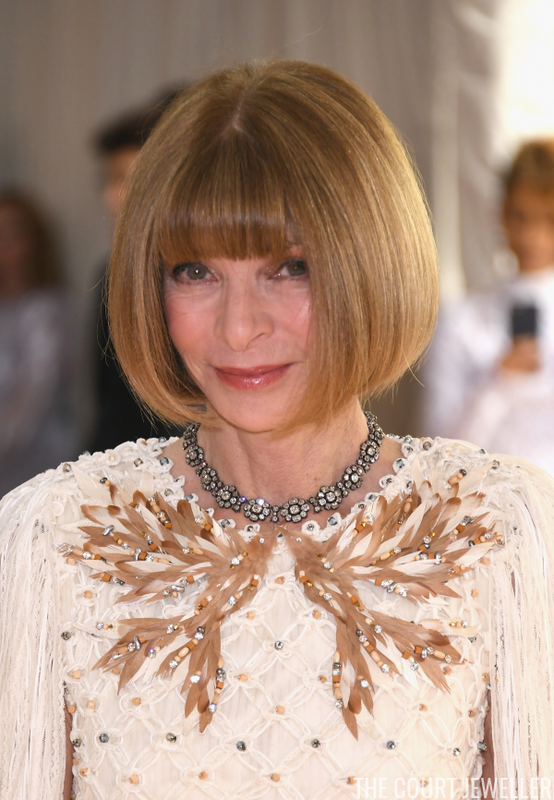 Anna Wintour, editor of American Vogue, wore a diamond floral necklace that definitely shouts "antique" to me. I believe it's the same necklace she wore to an Oscars party in 2015. 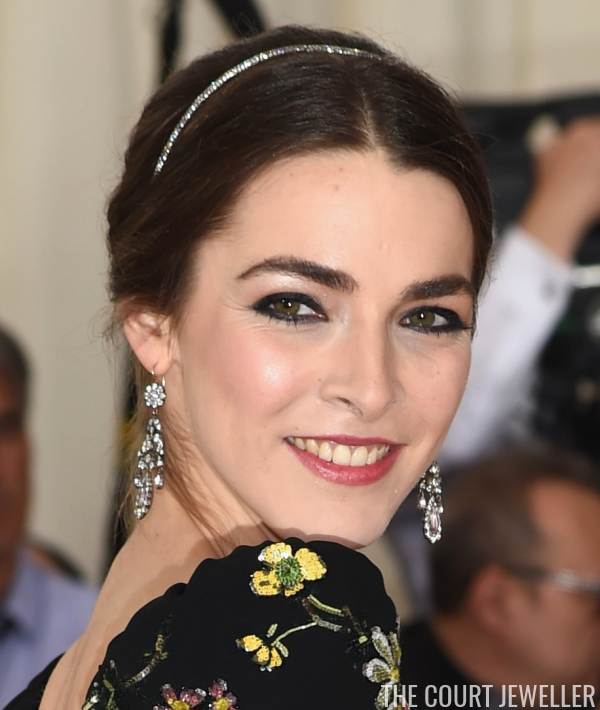 Anna's daughter, Bee Shaffer, wore a glittering headband with girandole earrings that also look like antiques. British model Poppy Delevingne basically glittered in head-to-toe jewelry. I really, really like the glamorous, modern, bejeweled earrings worn by Wendi Deng Murdoch. Chinese model Fei Fei Sun wore a shimmering pair of diamond pendant earrings. Rose Byrne's necklace definitely played on the technology theme -- it looks downright scientific. Saoirse Ronan accessorized in a major way, pinning a brooch made of rubies, pink diamonds, and white diamonds to the hip of her gown. Here's a better look at the brooch, which was reportedly made by Anna Hu. Model Lara Stone wore diamond pendant earrings with major wattage by Bulgari. 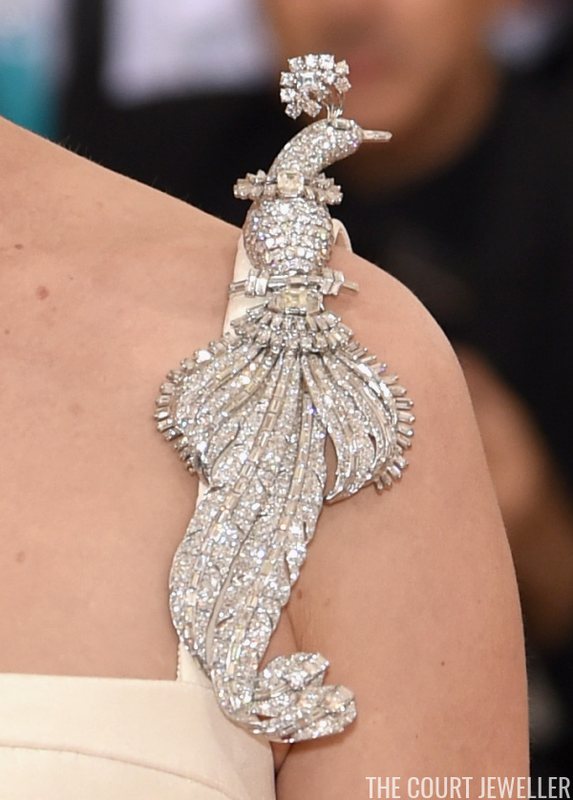 If you ask me, Uma Thurman nearly stole the entire show in this vintage Cartier peacock brooch. Here's a closer look at the brooch. 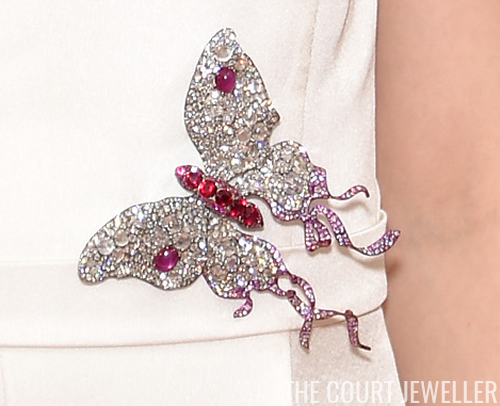 According to Cartier, the jewel is packed with more than 83 carats of diamonds. 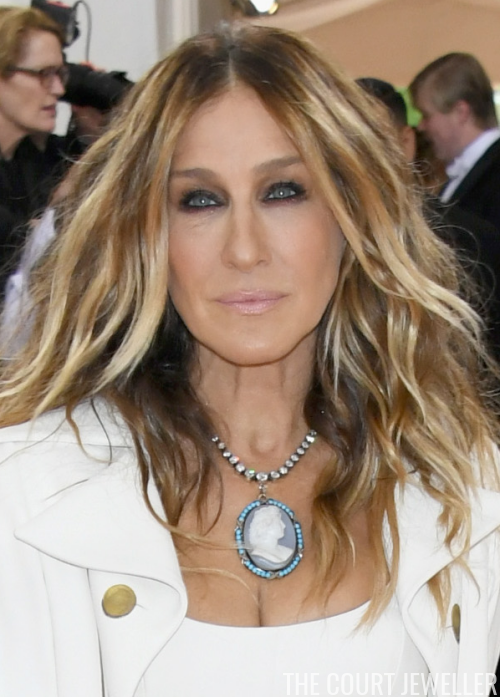 Sarah Jessica Parker wore a fabulous necklace from Fred Leighton; the firm describes it as a "rivière with an antique agate and turquoise cameo pendant." Kate Bosworth was half modern glam, half ancient warrior in a dazzling Dolce and Gabbana gown with a coordinating headpiece. Anna Hu also provided a gorgeous ring and earrings for actress Ellie Bamber. Nicole Kidman, bless her Australian heart, wore an honest-to-goodness button tiara to the gala. Model Hannah Davis wore a shoulder-brushing pair of diamond and pearl pendant earrings. Actress Allison Williams contrasted classic diamond and pearl brooches in her hair with a pair of ultra-modern pendant earrings. Fashion designer Tory Burch also went for contrast, wearing a classic riviere set with pink stones over a necklace with a chunky modern pendant. Katie Holmes wore a classic diamond Cartier necklace. Diamond pendant earrings were a lovely contrast with Jessica Chastain's royal blue gown. 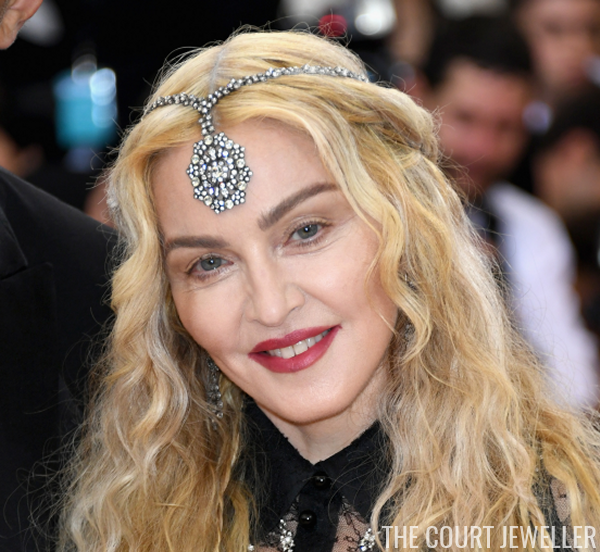 Madonna, always just Madonna, wore a major pendant necklace as a headpiece (and told an interviewer that her favorite part of the Met Gala was "the breadsticks," ha!). Zoey Deutch (daughter of actress Lea Thompson) wore amazing, elaborate jewels, including a jewel-studded headpiece. The look is by Dolce and Gabbana. ...get a load of these Lorraine Schwartz rings! Gorgeous! 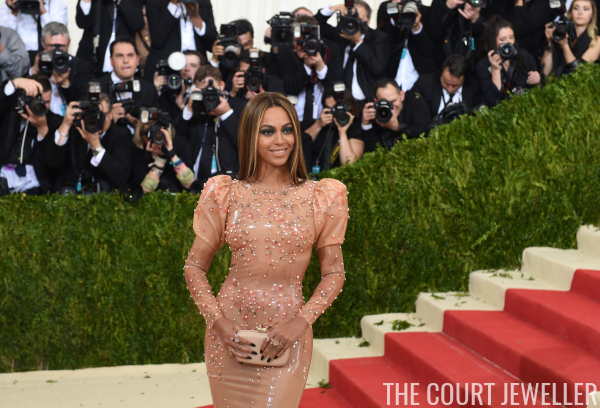 Which jewels from this year's Met Ball were your favorites?